Socialists just don’t grasp common sense it seems. I am one of those statistics who left New York. Republicans were specifically told by Cuomo that we were not welcome there. So I obliged. The federal tax law he cites is aimed at the wealthy. Now he’s crying because the wealthy are also leaving New York. But not just wealthy Republicans, Democrats too. 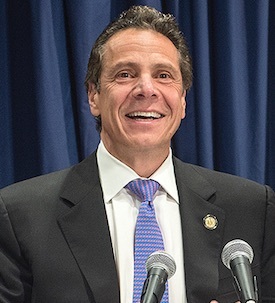 What happened to Cuomo’s Democrat mantra of taxing the wealthy? Trump did it for him. R.Jorgensen Seems I missed this speech. I grew up under standing I was a Citizen, now as a great grandfather, I am referred to as just a Costumer. The danger is that those who flee these high tax states will forget why they had to leave and take the failed ideology of VT, CT, NY or other high tax states to their new home, starting the whole cycle again. Wonder if anyone in NY ever thought of living within their means so they wouldn’t have to tax at such a high level. Now, as they say, the chickens are coming home to roost. As ye sow, so shall ye reap. Permitting federal taxpayers to exempt from their income the taxes paid to states is a pass-through subsidy to the high taxed states paid for by the federal taxes on the population in general – insofar as it is a reduction in federal revenue that permits high taxed states to derive revenue for expenditures that do not benefit the taxpayers outside the state. The federal government is effectively ‘paying’ more to the taxpayers in high taxed states to give money to those states. I grew up in NYS and still own real estate on Long Island. I lived in Vermont for 7 years up in the NEK. I now live in Florida. There is no income tax, no estate tax, no inheritance tax, no tax on interest and dividends. I have rental properties that I rent out to hard working people who don’t have a whole bunch of money at the end of the month. The entire northeast is headed for very hard times with the leadership that comes from one party. If a carbon tax is approved by NYS or VT, there will be traffic jams on every highway heading south. The property tax on real estate in the NE is choking everyone. Fleeing to low tax red state was a prudent fiscal decision my family made. My wallet and kids college funds very much appreciate it. Both of which where full of spider webs in VT. They are fleeing New Yorkistan because of taxes and the Marxists in control of the state. The merry Marxists in Montpelier could take a hint but they won’t in their zeal to be just like New Yorkistan..
Can anyone explain why this is ? Vermont would have seen an INCREASE in revenue due to the fed changes had they not adjusted the tax code. I doubt this NY drop has much to do with the fed tax bill. The underlying reasons for leaving NY have been there for a long time. For those who are close to retirement, Pennsylvania, Tennessee and Georgia either have no tax on retirement income or large exclusions. Texas and Florida are not the only beneficiaries of this migration. Of course it has, but with the federal government/red states subsidizing the high tax blue states the complete impact of their spending wasn’t being felt, the same goes for the tax bill. The state was pulling the wool over their eyes, and that wool was the write off that USES to be allowed. Bring on the carbon taxes VT, it’ll be the nail the coffin then perhaps you can start over on firm ground. Nothing like an additional 88 cents/gallon every time you fill that work truck up. Don’t forget the added cost on your heating bill … ouch. All you’ll have left are chiefs.The injuns will make a beeline for NH. Cheifs don’t like washing dishes,cutting grass,plowing snow,or especially digging of any kind.